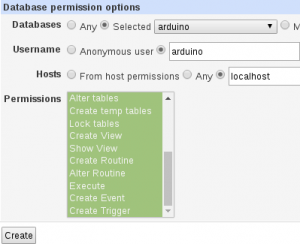 Creating an Arduino database using MySQL for your projects. This document will walk you through my personal preference for creating an arduino database and tables to log data from your project to this database. In this particular example, we will set this database up to log level, temperature, and humidity. You will need to already have a server setup in a LAMP configuration. If you do not have this set up already, please use this procedure to configure a VPS. Once you have a server set up, we will install webmin onto the server, and use webmin to configure our database graphically. We want to download the debian package onto the server, and not onto our computer. We will cancel the popup that prompts us to download the file to our computer, and right click the direct link, and copy the link location (or link address). We will use this link location to download the file onto our server. That’s wget, then a space, and paste the link you copied from the download page. This will download the file we need to install webmin. Now, in your web browser, you can go to https://learnautomation.com:10000, substituting your own domain name. You might have to choose “advanced” on the initial page to confirm that you want to enter the site. Whatever browser, you are using, you will want to get past the security messages, and confirm that you want to enter the site. Then log in as root with your password for the server. Now, Name your database, and press the “create” button. Press “Create” to finish creating the user. Now, we will associate the new user to the database, so back on the main MySQL page, we will select “Database Permissions“, then “Create New Database Permissions“. Complete the form similar to the one shown. Again, here we are mainly concerned with just getting the page running. You can always research more secure settings. To give this user all privileges, click the top privilege, scroll to the bottom of the privilege list. Hold down shift and click the bottom privilege to select all privileges. Then press “Create“. Next, we will create a table. In this table, we will have a unique ID to identify entries, and level, temperature, and humidity. 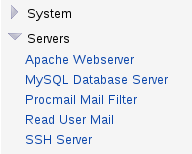 Back on the main MySQL Database page in Webmin, we will click on our “arduino” database. In this example, we will create 5 fields. The number of fields you use will depend on your project, and how much data you want to log. Please modify this accordingly. For logging our level, temperature, and humidity, we will set the table up as follows. Please modify these fields according to your project. Press “Create” and that’s it!!! You are ready to start using the table with your arduino project! !